Just today, I told myself I needed to make more of an effort to read more fiction every week, but there’ll probably be no fiction reading tonight or tomorrow. 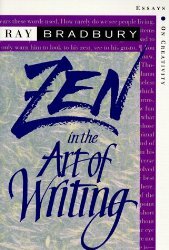 I received the book I ordered, Zen in the Art of Writing: Essays on Creativity by Ray Bradbury. I ordered this once and Amazon told me there’d been a problem with delivery, could I wait another 8 weeks for it? I said no, so I cancelled the order. Then a few days ago I noticed the book was available again and eligible for 2 day shipping so I reordered it. Got it today! Next Next post: Are the five minute sessions changing the way I write?